The production of stamps in Hawaii may not rival the early production of postage stamps by other countries, but there’s no denying the story and value of the early stamps produced in the state. The first batches of stamps in Hawaii were called the ‘Hawaiian Missionaries’ since these stamps were initially used by missionaries in the islands. Today, these postage stamps are considered rare, thus will command higher prices in the market. These stamps were officially introduced to the general public on October 1, 1851 and available in three denominations. The first set of postage stamps was also available in three rates. Collectors were treated with the 2-cent postage stamp, the 5-cent postage stamps and the 13-cent postage stamps, and different stamps were used for a specific purpose. Design-wise, the postage stamps were straightforward, with the numeral framed inside the printer’s ornament, and the denomination spelled out in the bottom. 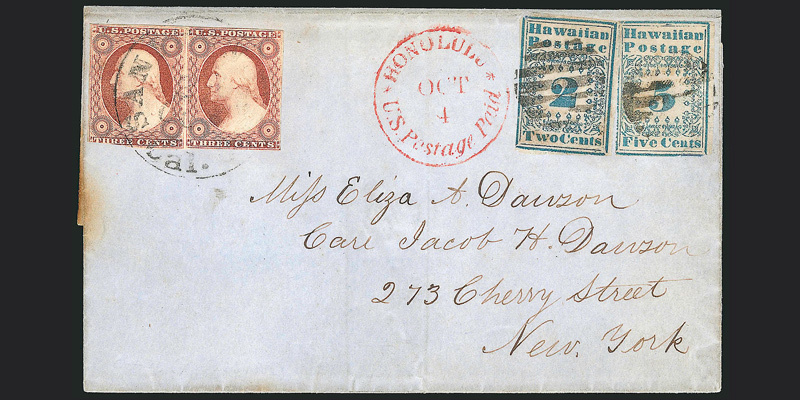 At the top of the stamp are the words ‘Hawaiian and Postage’ particularly on the 2-cent and the 5-cent versions of the stamps. For other values, collectors will find the initials and words ‘H.I’ & U.S./Postage. There is also a thin line enclosed in another thicker line that serves as the border for the postage stamps. The stamps were printed on pelure paper, in shade of blue, but often prone to tearing. This is one of the reasons why these postage stamps were rare today. Only a few survived due to their weak construction. Hawaiian Missionaries are rare, but the rarest of the batch is the 2-cent postage stamp, with 15 copies on record. One notable sale of the postage stamp netted $41,000 in 1963, then considered as the most expensive sale for a stamp. Here’s another interesting trivia about this postage stamp that have captured the interest of stamp collectors- Gaston Leroux, one of the early owners of the stamp, was murdered by Hector, Giroux, another philatelist because of the stamp. The stamp shown above is now considered a valuable member of the Missionaries stamps. This cover was shipped to New York City, and was known as the Dawson Cover. According to accounts, this was included in a bundle of correspondence that was left into a factory where a fire broke out. After 35 years, this stamp was discovered, with obvious scorch mark suggesting that this was partly burned. It was then purchased by George H. Worthington and was acquired by Alfred H. Caspary for $6,100 (1917). The stamp changed hands, and in 2013, this was offered in the market for $2.24 million.